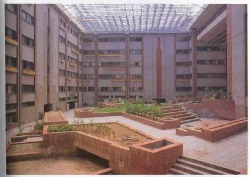 Other examples of the sixties development include the NCDC (National Cooperative Development Corporation) building and the Delhi Civic Centre(left)designed by Kuldip Singh. 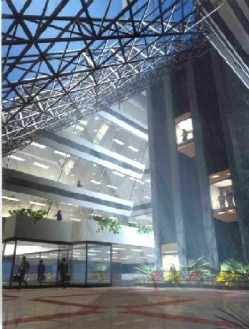 The NCDC headquarters has a circulation core in which elevators are linked to two sloping wings by footbridges. 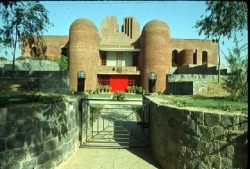 Closer to the explorations of late modernism in Europe and the United States is the pure sculptural work represented by the Bahai House of Worship(1980-86) designed by Fariburz Sahba and the Belgian Embassy (below, left) and the Ambassadors Residence in the Chanakyapuri Enclave by Satish Gujral. (1980-83).The Belgian embassy is a unique work in India. The chancery is an exposed brick building, which is an Expressionist statement and the ambassador's residence is more like an inhabitable ruin. 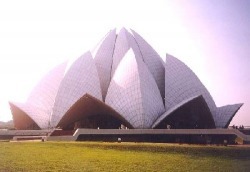 LOTUSTEMPLE- The Bahai house of worship (above, right) is a representation of an opening lotus flower, a flower sacred to many Indians. The structure consists of three ranks of nine petals each and uses water and light as decorative elements. It is also detailed to deal effectively with New Delhi's heat by drawing air over a reflecting pool to cool it. The building is designed to represent the clarity and clarity of the Bahai faith. Since 1970 architects have increasingly looked at traditional urban design and building types for inspiration. They have looked at the way light, massing and sitting has been handled; how decorative features form part of the architecture; the materials used; the construction process. The use of traditional forms has been explored in Raj Rewal's AsiadVillage (1980-82), his National Institute of Immunology (1984-8) (below, left), the Design Groups Yamuna Housing Society (1973-80), their YMCA staff Housing and their HUDCO bazaar. The SCOPE (Standing Conference of Public Enterprises) Building (above, right), designed by Raj Rewal (1980-9) is close to being a megastructure. It is almost 100,000 square meters; ten story building, housing seven thousand employees. It is a city within a city. Its sitting as an object in space is strictly Modernist. SCOPE's square modular system and corner towers make it look like a citadel. It is Modernist in its expression of structure; the service and air conditioning ducts above the roof like chimneys. All these buildings are one off statements. In contrast, across India, there are thousands of buildings highly similar in appearance. They are from the same cloth, so to speak. Their architecture has become known as Utilitarian Modernism. In addition to the vast social housing estates the design concepts have been applied to many other building types- district centres (e.g. Nehru Place), offices, shopping areas and institutional buildings, particularly schools. The central business districts serve a vital and useful purpose as the heart of the city, and its deterioration presents a challenge to business and civic enterprise.In this category we can place CP, Sadar bazaar and the district centres proposed by the master plan. (The Master Plan of 1962 for the city of Delhi proposed for seven district centers at- Nehru Place, Rajendra Place, Bhikaji cama Place, Janakpuri, Lakshmi Nagar, Shivaji Place, Jhandewalan). A second type is a small business district. The small commercial center contains the chain retail stores, professional offices, service supply enterprises, motion picture theaters, bank branches and stock exchanges. Then we have the neighborhood centers. 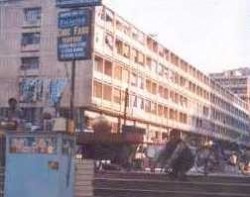 Coming back to the district centres-While the architecture of Nehru Place(below,left) is highly utilitarian and is not holding well over time its urban idea is nevertheless an Indian innovation. It segregates pedestrian and vehicular traffic and creates an internal plaza, existing as an island in the sea of parking. 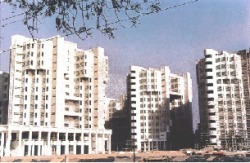 A step ahead from Nehru place-The District Centre at Janakpuri (above,right) developed on a 35 acre site and designed by Ranjit Sabiki serves as an important shopping centre catering to the needs of a large residential population of the area. Simultaneously providing for social, cultural, and recreational requirements through the provision of cinemas, a meeting hall, library cultural centre and a hotel. The graceful colonnaded arcade and the landscaped central garden of Connaught Place is an image of New Delhi that is easily identifiable. In the creation of a major new commercial centre in West Delhi this image served as a point of reference and thus the shopping centre at Janakpuri has a handsome double height colonnade which defines and ties together all shopping spaces. This in turn extends visually and relates to the landscaped courts and gardens of the District Centre. Another major preoccupation in the creation of this District Centre has been the need to provide a strong framework of order that would not in any way restrict the multitude of signs, lights and fixtures that define the expression of exuberance in all existing commercial centres within the city. Specific spaces have been defined for the erection of signs and hoardings, and in order to be able to camouflage the multitude of fixtures such as air coolers, air conditioners, etc. a system of pre-cast concrete louvers has been proposed. These louvers are spaced wide enough to allow light and air to penetrate through, but from a distance, they still read as a screen which in turn forms part of the standard facade and serves as a unifying element. 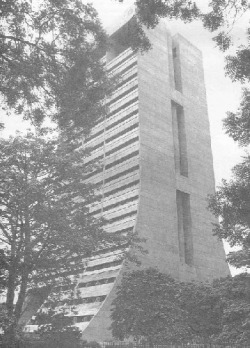 The design of the India Habitat centre marks a transition in the architecture of Joseph Allen Stein. This is mainly as an expression of a realization, perhaps sub-conscious, that buildings of this scale and function represent the complexities of contemporary society, where a building is an artifact that can be critically altered by its users and respondents. Hence there was a conscious decision to under build. The IHC utilizes only 1.4 of the 2.5 FAR permitted at the time of construction. The IHC contains a variety of functions that cater to almost all types of requirements. Major office spaces are located in the blocks adjacent to the main streets, the associated functions such as guest rooms, staff quarters and the auditorium are adjacent to the Lodi colony housing. The blocks housing the offices are articulated to form the three courtyards, the ground levels of which contain public functions such as exhibition spaces, fast food restaurant, banks etc. and access to the vertical cores. The blocks adjacent to the housing area have been progressively reduced in volume and the auditorium is set back substantially from the plot line to create a distinct entry. The traditional district centres have given way to more "global" office buildings. 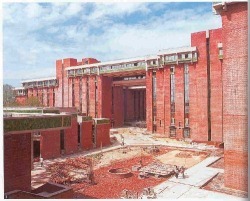 Located on a site adjoining the historic Jantar Mantar Observatory, the DLF CENTRE (designed by Ranjit Sabiki) follows the curved form of the erstwhile Narendra Place building on the same site and also reflects the curved form of the Park Hotel on the opposite side across Parliament Street. Conceived as a sophisticated office complex, the building is the most up to date structure of its kind in the capital having central air-conditioning, a sprinkler system, fire detection system, reverse osmosis water system, and a full capacity stand-by generator. Parking and services are accommodated in three levels of basement below ground level and the offices are distributed in the ten floors above ground. Externally, the building is expressed in a simple curved curtain wall on the front and back with a granite colonnade defining the lower two floors. The two end walls have long uninterrupted curtain walls, which to the South provides a spectacular panoramic view of the Jantar Mantar Complex. Amba Deep Tower, Kasturba Gandhi Marg, Delhi is a cluster of three towers with the tallest of 23 floors, grouped around an 8-storeyed atrium. The covered area of the complex is 2, 00,000 sq.ft. A glass capsule and a large, multi-level Shopping Centre are some of the important features of the project. 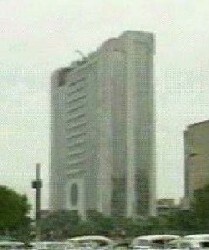 It was completed in 1992 at a cost of Rs. 20 crores. Designed for the Ansal Group of Companies by CP Kukreja associates, Amba Deep is a forceful blend of the traditional and modern high-tech. Located on a 1.3 acre corner plot in Connaught Place, the building has advantage of a segregated car park with vehicular entry from the side road- a major plus in the busy area it is stimulated in. The building is an interesting massing of three vertical tower blocks, basically square in plan, of varying heights arranged around an atrium- the cohesive design element. The tallest tower is 21 storeys (84 m high) and overlooks the arcaded terraces of the smaller towers (14 storeys and 9 storeys high respectively). The two smaller blocks as well as the glass encased lifts overlook the landscaped atrium. Storage areas, the air-conditioning and mechanical plant along with an electric sub-station and the mandatory car parking requirements are all housed in three basements of the building. Essentially commercial in nature, the building is carefully designed to allow for maximum floor area coverage. Landscaping is an integral part of the design and strong elements that penetrate into the interior of the building include the atrium, with its terraced waterfall and planters, and a court at the back of the buildings which is overlooked by the staff canteen and the ground floor. The bold facade treatment in long continuous bands broken at corners by square pilasters uses geometric patterned glass tiles in shades of white, yellow and blue- used so strongly perhaps for the first time in a modern building of this scale. The DLF Corporate park (left) is a unique concept of seven corporate towers on one site. Conceptualized by DLF Universal Ltd., the leading developers of Delhi’s satellite city Gurgaon and located just outside Delhi, CorporatePark is the hot new business address in Delhi. The towers have been bought by various multi-national corporations like Pepsi, Dupont, etc. Five of the seven towers are used by individual organisations and two have been given floor wise. A common basement serves as a car park and houses the services. The high-performance glass and alucobond cladding system used in these structures is state of the art and particularly suited to achieving the corporate look recognized all over the world. The area around the tower blocks is landscaped to form a harmonious and pleasing mix of stone paving, water bodies and grassy mounds. The serene surroundings contribute to the productivity of the workplace. Signature towers- is a Joint Venture office complex project with M/s. 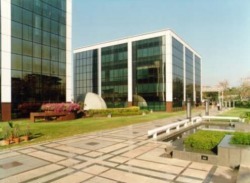 Unitech of New Delhi and Singapore Consortium located on the outskirts of Delhi on Delhi-Jaipur Highway, The complex has 2 basements with 2,50,000 sq.ft and 15 upper floors with an area of 3,50,000 sq.ft. The complex is centrally air-conditioned with 100% back up power, high-speed lifts and comprehensive Building Management System facilities. The BMS facilities include energy management in lighting, power and air-conditioning, fire fighting control, security and billing system, car parking management facilities etc. The cost of the project is estimated to have cost Rs. 90 crores. 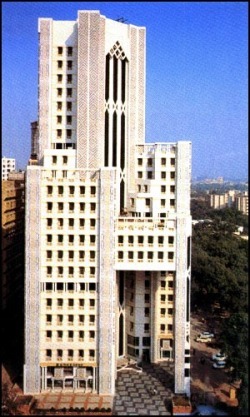 The Capital court office complex has been designed by Raja Aederi (the architect of Le' Meridien). The building has a maintenance free finish of heritage plaster with a granite band, along with structural glazing. The complex houses seven floors of varying areas ranging from 20,000 to 10,000 sq. ft. This has been achieved by staggering the floors at all levels as you go up. The use of beam and slab construction has provided large column free spans which provide the offices with flexibility of space utilization. Each corporate house owns a floor area of at least 5,000 sq. ft.The scale and height of the atrium provides an ease of circulation and access and leads directly into the lift core which houses capsule lifts which enable a visitor to enjoy the scale of the atrium at upper levels as well. It is important to recognize that design of office buildings has become more complexthan what it was fifty years back. Projects are larger, and more agencies and business undertakings are involved and the clearly definable patron has vanished. Office buildings are driven by market forces other than any other building topology. This exposes architects to an interesting facet of the profession- the ’business of architecture’, something that is always believed by architects as hard to accept.Furthermore, the level of technical complexity is greater and above all teamwork is the buzzword. Many more consultants need to be involved and technical integration has become vital. Successful office design, today, is much like a carefully orchestrated symphony. Virtual offices or ‘intelligent buildings’ are fast becoming the norm of the day. 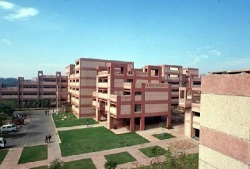 The functioning of such buildings is controlled by advanced computer systems. An Intelligent Building Management System (IBMS) helps make minor adjustments to control the air conditioning and lighting in response to the changes in climate, so as to maintain a conducive working ambience for employees. Companies like Compaq are already using the concept of ‘hot desking’. 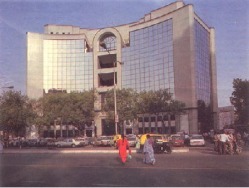 IFCI, Delhi- This is a unique building in Delhi with ground and 22 upper floors, providing columns less office area on each floor. This is also one of the First Intelligent Buildings in Delhi. Won in competition the scope of the builders included total architectural and other services until final completion and handing over. No car parking has been provided as clients intend to provide parking in the multi-level car park to be constructed by Delhi development authority. The building has central A/C, with cabins having split A/C units for after office hour use.